“I must tell you that when I opened the box and pulled out my quilt and pillow, I was truly overjoyed as I looked at them… seeing each of my Hard Rock Café t-shirts (that were once folded and housed in a drawer) transformed into a beautiful vibrant quilt and matching pillow was beyond amazing. As I continued to look at them I was, to say the least, awestruck!! When I first contacted you and discussed what I was hoping to have done, I wasn’t sure what to expect for the finished product. The colors of the fabric you sent via mail over the miles between you in California and me in Texas… the phone calls we made back and forth discussing ideas and making decisions… WOW! I really don’t think my imagination does justice to what you did…I had no idea what to expect, but I will tell you, I can’t wait to show my quilt and pillow and your breathtaking and mind-blowing artistic talents to all my friends. “Having just picked up a quilt that you quilted for me, I have to tell you that I am thrilled with it! When I complete a quilt top, I have a vision of how it should look when it’s quilted. Occasionally, I’ve picked up a quilt from a long-arm quilter and been a little bit disappointed, not because the workmanship was below par but because the completed quilt, while beautiful, wasn’t my vision. The ‘Old Lady Quilt’ I picked up was not only my vision; but even more than I could have imagined! I wanted it to be outdoorsy and fun ‐ more masculine and not flowery. Norm took the time to ask me what I had in mind for the quilt and chatted with me about it. Then he showed me just what I was looking for. Having him point right to the picture rather than asking me to flip through pages and pages of designs was terrific. The design I chose was wonderful; but when it was sized to fit my quilt it was unbelievable! I also have to tell you that whenever I enter your shop I feel like I’m visiting friends and I’m certainly greeted as one of the family. When I brought in three quilt tops at once and was asked if I would like to pick them up one each month for the next three months, I breathed a sigh of relief. Again I was made to feel very comfortable discussing what, for me, is an uncomfortable subject. “I just wanted to take a minute to say thanks. When I received my order yesterday I was so thrilled to see the workmanship in this quilt. It makes me wonder why I spent so long looking for a pre-made one when it is so obvious nothing I would have found could have compared to the one you made. It looks great on the bed and ties the whole room together. It was so nice to be able to meet with you after you chose the fabrics to approve the colors. Although it was not necessary since after seeing your work I found your taste impeccable. I could not be happier. I think you guys are doing a wonderful job, and I was just awestruck by your entire operation! “It would have been impossible to imagine the huge pile of used, tattered, stained and varying sized t-shirts I turned over to you could be so magnificently transformed into a beautiful quilted heirloom. From my first conversation with Norm, I had complete confidence in your capabilities, Nancy, but personally had difficulty envisioning that this diverse collection of shirts could actually become this grand reflection of my daughter’s teen years. It was a wonderful surprise for her 30th birthday and I believe other family and friends are now a bit envious and regret not saving their shirts. I appreciate how you kept me informed and involved in making the final selections on fabric, binding, etc. Of course, you made that easy by choosing only fabrics and colors to accentuate the project. We all love, too, the personalization of the five sports reproduced in the quilting. The photos and the sentiment was the final touch to perfection! “When I was a kid I was always a little envious of the kids with the monogrammed backpacks, socks, t-shirts, bathing suits, towels,… I finally found a reason to get something monogrammed and being a newbie, NotJustQuiltZ was perfect for my needs. “I needed names embroidered on aprons as a present for someone very special to me, but needed it done quickly because I had three days before traveling to see the person. 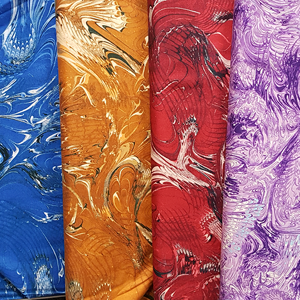 The staff at NotJustQuiltZ not only helped me decide what would look best on the aprons, but they recognized that I needed the job done as quickly as possible. I dropped the aprons off on a Wednesday, and by Thursday evening they called me to let me know they were already ready for pick up. 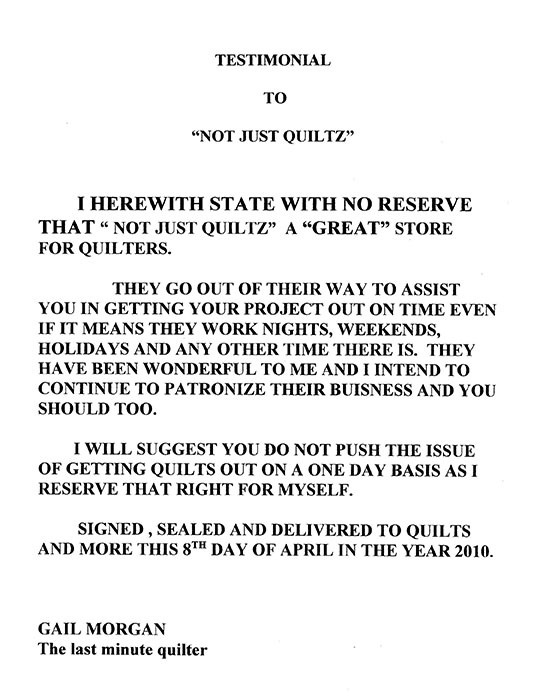 “I hereby proclaim Nancy to be ‘The Queen of Long Arm Quilting.’ She’s done truly amazing work on the quilts I have brought into the store. I really value her judgment in finding the perfect stitch theme to accentuate my quilt tops. I go for somewhat quirky multimedia projects and her inspirations for patterns and thread combinations have escalated my work to a much higher level.